Construction of new infrastructure has already started. At the moment it is concentrated in the new bike park that complies with international standards, as well as in modernization of the existing central park. 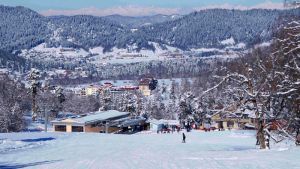 The nearest future plans include construction of a popular attraction Toboggan (simple sled), trails for biathlon, two cableways and a hotel for 300 people. Bakuriani is considered to be the oldest Caucasus ski resort. It is located 30 km away from Borjomi and 180 km away from the capital city of Tbilisi on a 1700 m height above the sea level. Both Borjomi and Bakuriani were among the applicant cities for 2014 Winter Olympic Games. Currently Bakuriani has ski routes for both, skillful skiers and beginners. One is “Kokhta-1”, a two-step route with a chair lift and 1,500m long; and another one is “Kokhta-2“, tatrapoma/tugboat where steep slopes alternate with smooth slopes, and a “Plato” route for beginners with bar lifts. One of the most famous paths is the route of the Didveli complex with a gondola lift. Ski lifting at the Tskhratskaro pass which is 13km away from Bakuriani on the height of 2454 m is available for those who love country skiing.